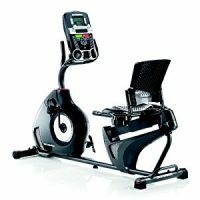 The Schwinn 230 Recumbent Bike is a feature-packed exercise equipment consisting of literally everything you need to lose weight and get toned as well- and all that in maximum comfort. 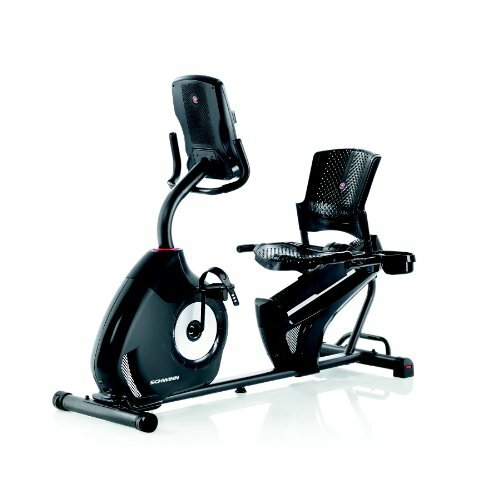 The bike features 20 levels of resistance alongside 22 workout programs. That coupled alongside the fact that it is low-priced despite being a product of Schwinn, a renowned and long-running brand, makes this bike one of the best in the market today. It features a low profile and walk through frame that makes it easier for you to get on and off the bike. Thus, it is perfectly suited for a majority of low impact workouts. Everyone, especially those who are recovering from injuries, or those who want better support for the lumbar when they are cycling, or those who are simply looking for low impact type of cardio: they’ll all find the Schwinn 230 Recumbent Exercise Bike of great use. Ergonomically designed seat. The bike’s seat is ergonomically designed to offer proper lumbar support as well as an impressive range of different positions that make the bike ideal for both shorter and taller users. The bike features two levelers: one attached to the base rail and the other built in the rear stabilizer. These levelers help whenever there are any uneven areas on the floor where you rest the bike. The levelers ensure that the bike stays stable all through even during the very intense workouts. The machine is highly portable. It is very easy to move around. If you need to move the machine around after setup, there is a slew of transport wheels that are attached to the bike’s front stabilizer. You simply have to lift up the back of the bike with the aid of the large handle that is available and roll the equipment to wherever you desire it to be. 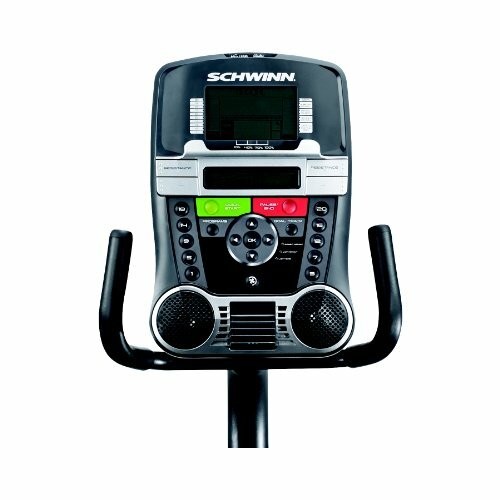 The machine also comes with a Schwinn Dualtrack LCD window system that allows you to watch as many as 13 display feedbacks. It helps you to track progress and download the data through the Schwinn Connect website to a USB drive. The contraption has an integrated speaker sound system that you can use to listen to your MP3 player or iPod while you exercise. Besides, it has a speed workout fan to keep you cool during the workout. 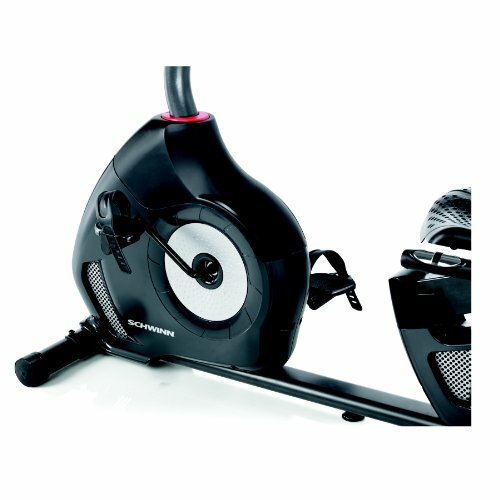 A functionality that makes it possible to transfer data from the USB drive to the Schwinn connect. There is a water bottle holder ensuring the user tray remains hydrated throughout the exercise session. Its maximum user weight is 300 lbs. It features transport wheels for easier mobility. There is a media shelf for a wonderful exercise experience. A high inertia drive system alongside a perimeter weighted flywheel to make possible a smooth and consistent workout. 20 levels of resistance for different workout intensity. 3-speed fans to keep user cool during the exercise session. 4 heart rate programs featuring custom settings. DualTrack two LCD window system. Two user profiles where you can store personal information or workout data. Two fitness test programs that can measure any physical fitness improvements. It is feature-rich. 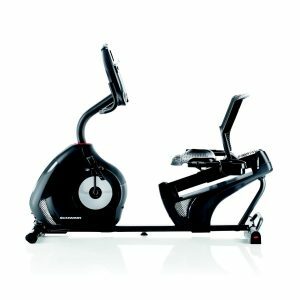 The Schwinn Recumbent Bike has virtually everything you’ll need in an exercise bike: intense workouts, enjoyable exercises, comfort, etc. It comes with an excellent console having many workouts. You can also download exercise data any time. The machine can also keep you connected to its media shelf. What is more? The Schwinn name! You get what only a century-old manufacturer can provide. The Console. For a mid-range bike, the Schwinn 230 Recumbent Bike features an amazing console. The console has 22 programmed workouts, and you can download your exercise data so that you may track your performance after each workout. These programmed workouts offer a fun and thrilling exercise experience and permit you to choose the desired intensity: for example, you can choose between a strenuous mountain ride or a fun workout. The quality of the bike is another wonderful thing worth talking about. For a brand that boasts of more than 100 years since inception, you couldn’t expect anything less than a high-quality product. According to some reviewers, the seat can get uncomfortable when doing workouts that are longer than an hour. 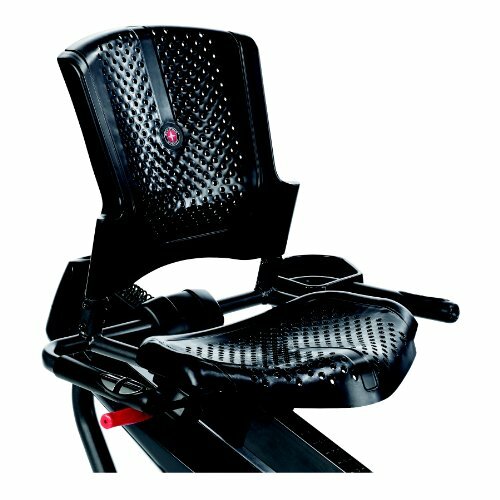 It does not have padding on the seat such as the one on the Schwinn recumbent bike. Despite the few cons, Schwinn 230 Recumbent Bike is still a great machine. For a mid-range bike, it already offers more than its bargain. You don't have to worry about anything as it is feature-packed to provide the best workout experience ever.